The purpose of the celebration in 1994 is to mark the centenary of our Masonic Hall, but to appreciate the foregoing we must look back, briefly as the history of Sun Lodge has already been well documented in a previous publication (A History of the Lodge by W. Bro. W. G. N. Gorfin, MBE, PPrJGW). For that reason I will look very briefly and just give a lead up to that great day 100 years ago. Sun Lodge was consecrated in Newton Abbot on March 17th, 1759, at the Sun Inn, Woolborough Street; the name no doubt was taken from the Inn and was given the number 240. Also of interest the date – March 17th – “St. Patrick’s Day”, no doubt chosen by its founder Members who were mainly Irish clay workers (working in the nearby Bovey Clay Pits). A very chequered and disrupted period followed with the Lodge having several numbers (i.e. 196, 160, 161, 141, 171 and 123) and finally in August 1863 it was given the present number 106. Much of this was due to the period of controversy that existed at the time between The Ancients and The Moderns i.e. two different organisations, one under the Grand Lodge and the York Lodges under the Duke of Atholl. Likewise warrants got lost and sometimes sold, and administration was very lacking – at one period the Lodge nearly failed due chiefly to one of its members leaving the area without any trace of whereabouts. Due to circumstances we are not quite sure but the Lodge moved to Starcross for a short period, but this cannot be firmly established. The Sun Lodge next moved to Exmouth on 18th January 1784 at the Dolphin Inn. Then it moved to the Globe Hotel, The Strand, now the (former) site of Clapp’s Cafe, in 1808. In 1817 it moved back to the Dolphin Hotel at the Cross, in 1842 back to the Globe Hotel and in 1866 when the Globe Hotel was demolished Sun Lodge moved its quarters in the ballroom of the Royal Beacon. After another 28 years it obtained its present home in the Exmouth Masonic Hall in 1894. As will be gathered, all those moves were very inconvenient and no doubt frustrating, because the Lodge was in the hands of the landlords of the various establishments, and having to rely on the goodwill of the landlords for the storage of Lodge furniture etc. Not a very satisfactory arrangement and it is not surprising with a healthy membership of 101 members at the time, members began seeking some way of acquiring their own premises. So on April 8th, 1889 W. Bro. Perry J.W. gave notice of motion that it is desirable in the interests of Sun Lodge – that we have a building of our own – and to discuss means of working out the best way to achieve this. The Worshipful Master asked members to contribute £7 shares, and a site was initially offered by Lord Rolle, in Tower Street. June 8th, 1891 – The Lodge approved the Committee action and urged immediate steps to proceed, to get tenders and obtain the lease from Lord Rolle. (At this stage it was proposed the building be shared by the YMCA occupying the ground floor). July-August 1891 – A set-back – by a Lodge member who had an interest in the site and raised a lot of problems. The scheme was shelved. November 1891 – Another site was found near Manchester Street area – two cottages were being offered for auction and in December when the auction took place they realised £770 – a sum the Committee thought too much. April 11th, 1892 – Another site was offered in Clarence road by another member of the Lodge, but on inspection the Committee did not consider it suitable for a Masonic Lodge. February 6th, 1893 – Another site in Elm Grove area was offered, but rejected by the Committee. January 1894 – The Hon. Lord Rolle suggested a site in Ferry Road (now St Andrews Road) our present home – this was accepted – the land being leased from The Hon. Mark Rolle on a 99 year lease, £2 for the first two years and afterwards £4 for rest of term. Messrs. Karley and Ellis were asked to act as Hon. Architects and draw up plans for the suggested building. Plans were soon prepared and final arrangements made for the laying of the foundation stone ceremony taking place on March 28th, 1894. The cost of the building was £1,400 plus some £390 for furnishings. 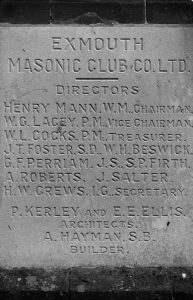 March 12th, 1894 – It was proposed that the Provincial Grand Master be asked to nominate someone to lay the Foundation Stone. The person he chose was Worshipful Brother Robert Tucker-Pain,. the then oldest surviving Past Master of the Lodge of Harmony, who in turn asked his wife to do the honours. March 28th, 1894 – A Lodge of Emergency met at the Royal Beacon Hotel and the reason of Emergency was discussed, The members retired from the meeting in procession to the new site in Ferry Road. The Worshipful Master gave a short history of the Lodge since 1759 and then called on Mrs. Tucker-Pain, wife of Worshipful Brother Tucker-Pain, to lay the foundation stone, which she declared well and truly laid, with the silver trowel provided. The Anthem “Behold how good and joyful a thing it is for Brethren to dwell and to gather in unity” was sung by the Brethren and members of the public who witnessed the ceremony. Worshipful Brother G. Gordon Bourne delivered an ovation – The Worshipful Master conveyed the thanks of the Lodge to Mrs. Tucker-Pain – this was supported and seconded by Worshipful Brother Colonel Adams. 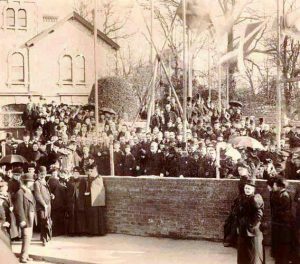 Exmouth Masonic Hall, laying the foundation stone, March 28th 1894. Mrs. Tucker-Pain responded and thanked the Worshipful Master for his kind expressions and had pleasure in placing a cheque for £20 on the stone. Worshipful Brother Tucker-Pain likewise placed a cheque for £10. The National Anthem was sung and the Brethren reformed in possession and returned to the Lodge and the Lodge was closed in Peace, Love and Harmony at 4.30 p.m. Afterwards 40 Brethren dined at the Royal Beacon Hotel. September 8th, 1894 – a Saturday – when the Brethren of the Lodge attended for a Lodge of Emergency at the Royal Beacon Hotel at 2.15 and assembled outside and marched in full regalia, accompanied by the Exmouth Rifle Volunteers Band, for service at 3.30 in Holy Trinity Church. Here a large number of Masons from most of the Lodges in Devon attended the service, where the sermon was preached by the Provincial Grand Chaplain, the Reverend T. W. Lemon, 0.0., P.P.J.W. After the service the Brethren re-assembled, with the band at the head of the procession, marched down Rolle Street around the Strand to the new Lodge building in Ferry Road – here in order the whole procession preambled the Lodge once. The Lodge was opened in the First Degree and the Provincial Grand Secretary requested the Deputy Provincial Grand Master to dedicate the building which he did after scattering and sprinkling corn, oil and wine, after which the Provincial Grand Chaplain read the dedicating prayer – 2nd portion – and the Deputy Provincial Grand Master declared the building duly dedicated. Later a banquet was served at the Royal Beacon Hotel, which was attended by 30 Provincial Officers, 17 Officers of the Lodge, 36 Brethren of the Lodge and 31 visitors. The style of the building is very much as we see it today i.e. The Temple and Ante-Room on the first floor – between floor, a Refectory or Committee Room as we know it – between the war years the Festive Boards were held here after the Lodge meetings .Here the Brethren would retire to partake of refreshments. These refreshments were provided by the Tyler/Steward who resided in the adjoining cottage. The food was prepared by the Steward and his wife and conveyed to the Long Room by a “dumb waiter” situated at the north-west corner of the room and downstairs at the exit door to the cottage – all this was removed when the new bar was constructed. These refreshments were very basic compared with our present four course meals that we enjoy – mostly pasties, pickles, sandwiches, cheese etc. with tea. After suitable replies the Brethren would adjourn below to the small bar, that was sited in a small area in front of our present bar, leading from this area were two doors at one end leading to the toilet area and the other to the Steward’s accommodation. The Ground floor approached by a tiled entrance Porch and through a stained glass screen to the Hallway. On the right side (now kitchen) was the Secretary’s office and toilets. To the left side was a large Reading Room and adjoining this was a Billiards Room, now both used as one Dining Room. The Ground Floor area was in many respects quite apart form the Masonic activity side of the building, this being in fact a private Gentleman’s Club, known and registered as the Manor Club and it had subscribing members who were non-Masons. The Club was open all day, with the Bar open during licensing hours. Between the war years it was a popular lunchtime meeting venue for local businessmen. Exmouth Masonic Hall, foundation stone. The Secretary’s office was designed for the purpose of administering the Club side of the building i.e. the registering of members, administration, storage of records, both of Masonic and Club members as required by the law as a private Club. Membership of the Club was automatic if you joined either Sun or Rolle Lodges and many members held dual membership of both Lodges (a reduced fee was charged). Non-Masons were naturally restricted to the ground floor areas. In the 50’s social patterns began to show marked changes and the Club side was getting less and less supported. Membership dropped and the Club side closed, other than for Lodge meetings. There had been a great decline in the private members and it became apparent most of the members were only interested in the Masonic side of the building. During the 50’s the building went through a very difficult period. Jealousy had developed between the Lodges, and much animosity and bad feeling existed, much of this stemmed from several short-sighted, strong-willed Past Masters of both Lodges, who would not compromise, the issue being the property belonged to Sun Lodge (The shares of the original Exmouth Masonic Club Company were in 1924 acquired and also a gift made to Sun Lodge by Worshipful Brother Captain E. A. F. Coleberd) The Lodge administered, controlled and set the rents and did not wish to share any responsibility of the building. During this time little was spent on the upkeep and maintenance of the property and the place had a very shabby atmosphere both inside and out. This included the Trustees of the building, who were also divided on issues. To try and resolve matters a General Meeting was convened, all members, with the Provincial Grand Master and Provincial Grand Secretary conducting the meeting but the outcome was no progress and things continued to deteriorate into the 60’s. However a crack of light was appearing chiefly from the younger members, who like most members were very disillusioned and distressed to witness the depths that Masonry in Exmouth was sinking. The then Masonic Club Committee which had tried to run the social-side of the building, and had representatives from both Lodges serving on it, put forward a suggestion to involve Rolle Lodge as a working partner and be given certain rights and responsibilities to control the building. This was received very luke warm during the first months of the idea but after some two years debating and arguing a draft scheme was put before the two Lodges to share equal responsibility in the running and maintenance of the building and this was finally accepted by both Lodges in 1964 with Sun Lodge retaining the ownership of the building vested in four Sun Lodge Trustees. At this point it is worth reflecting on the state of our property at that time – the exterior in a poor condition with peeling paint and rotting woodwork and the roof causing much concern. The interior paintwork was dark and dirty with peeling walls, cracked and holed linoleum on the floor. In the Temple the lighting was poor, the carpet very worn with holes in places and the curtains torn and faded, the whole heated by a very inefficient solid fuel boiler, subject to frequent breakdowns and heavy repair bills. Since the formation of The Masonic Hall Committee in 1964 the roof has been repaired, the building re-wired and modern lighting installed together with a new heating system, new windows, new bar, kitchen, and toilets. The reading room and billiard room have been turned into a dining area seating approximately 100. The building has been painted and decorated inside and out and recarpeted throughout. So brethren just reflect what has been achieved in the last 30 years, you can see it all around you, it is the envy of many of our visiting Brethren. Just remember Brethren we are the temporary custodians of this heritage, it is incumbent upon us to ensure that we pass the Masonic Hall to our successors in the same good state of preservation as we received it. So much has been accomplished by the present members generosity and the efforts of your energetic Masonic Hall Committee over the past few years but this improvement in an ongoing situation and we must never relax our efforts to keep our home in its present admirable image.